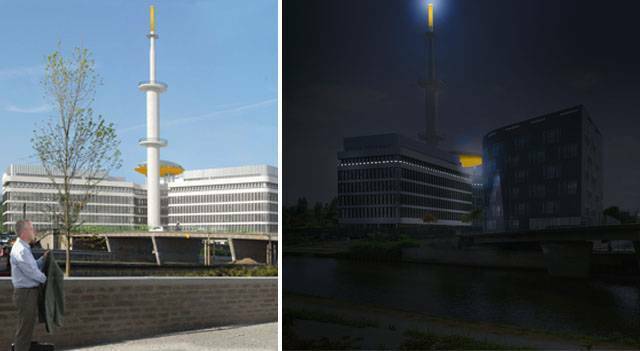 Though Germany once had a thriving tradition of "Kunst in Offenlichen Raum" -- a fairly analogous concept to Anglo-Saxon public art -- spending cuts in recent years have largely derailed new projects. 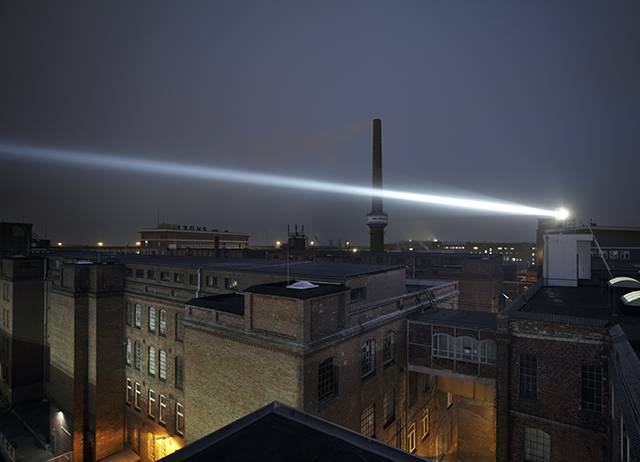 In the wealthy port city of Hamburg, however, British artist Anthony McCall realized a city-spanning light installation, "Crossing the Elbe" (through March 22, 2014) in which three search lights, located on top of the Spiegel newspaper building, a bunker in Wilhelmsburg, and the Falckenburg Collection light up the sky in narrow beams for 20 minutes each evening after sunset. They follow a slowly sweeping course over the river, throughout the piece's year-long run. The project is a poignant, Foucauldian metaphor for the city's current "Leap across the Elbe" initiative as part of the Internationale Bauausstellung (IBA), which seeks to enliven previously neglected (and impoverished) neighborhoods south of the river. 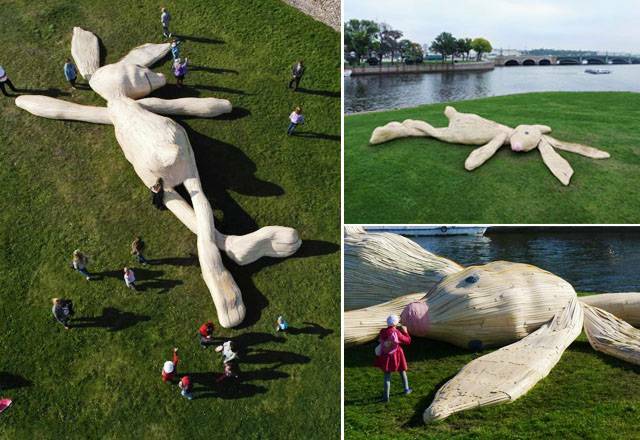 From globe-hopping giant rubber ducks to a 45-foot long wooden rabbit, Dutch artist Florentijn Hofman is the enfant terrible of giant contemporary sculpture. His latest, "Sunbathing Hare," stretches out on the bank of St. Petersburg's Neva River on Hare Island near the St. Peter and Paul Fortress and is the most admirable public piece of contemporary art in Russia's culture capital. Made as part of a year-long bilateral cultural program between Russia and the Netherlands, the artwork adds to the Russian legend of a hare, which saved itself from drowning by hiding in Peter the Great's boot during a flood. (Hence the name of the island, which also has another, smaller permanent hare statue.) Its arms stretched out, legs crossed, the "Sunbathing Hare" is made of light wooden strips with orange, pink, green or gray color combinations and will remain on the island until October 13. In the Shanghai Graffiti Park (No. 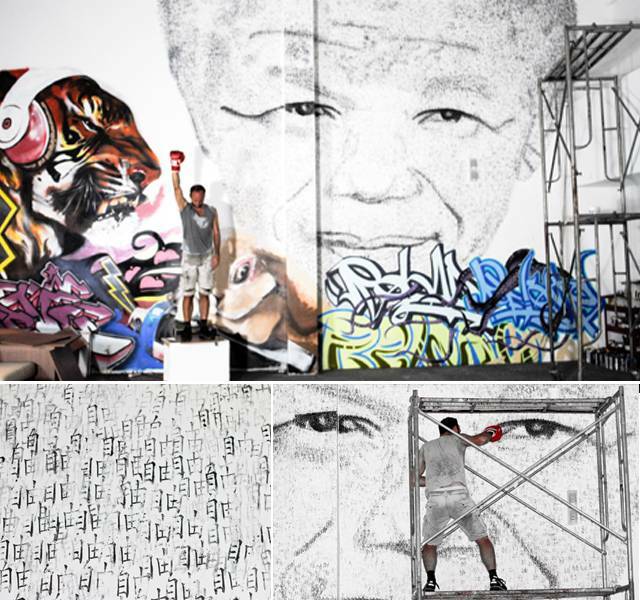 709 Lingshi Road, inside the Electric Industrial Park), Belgian-born Shanghai-based artist Phil Akashi has created a mural of Nelson Mandela using a boxing glove to which he attached a seal engraved with the Chinese characters for "freedom." After dipping the glove in black cinnabar paste, Akashi punched the wall 27,000 times to print a monumental portrait, called "Tribute to Mandela." Inspired by Mandela's lifelong stand for freedom and equality, Akashi's seal painting can be considered a way to promote democracy through art in politically restrictive China. 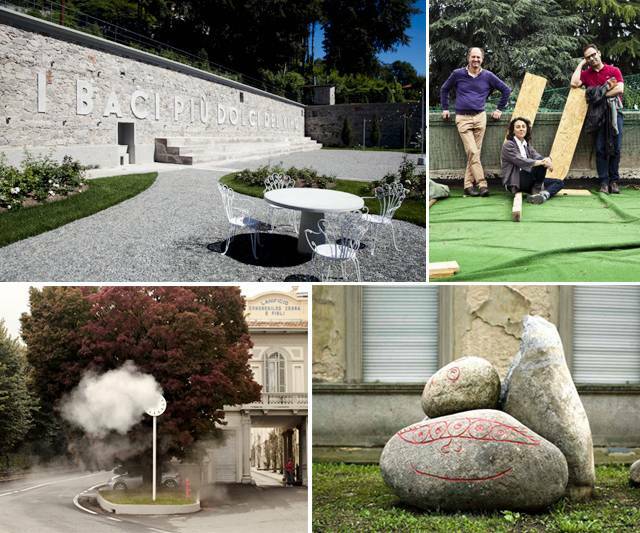 Thanks to Fondazione Zegna's ALL'APERTO art initiative, in which an established artist is given a permanent public art commission, the northern Italian village of Trivero is becoming a must-visit contemporary art getaway from Milan. This year, curators Andrea Zegna and Barbara Casavecchia have chosen Italian artist Marcello Maloberti to create "Kisses Sweeter Than Wine," a constantly evolving garden (of sorts) with white roses, furnishings, and big bold writing on a wall -- translated as the "joy of being together", a very Italian fact, indeed -- all created according to bio-energetic standards. The October 5 opening included a street party and choral performance that involved the local Alpini (Mountain Troops), kids, and athletes among others, and presented a good excuse to escape from bigger cities that, in Italy, may be rife with classical sculptures and fountains but don't take enough care of contemporary public art projects. Make a tour of it by exploring past ALL'APERTO works by Daniel Buren, Roman Signer, Alberto Garutti, and Stefano Arienti. 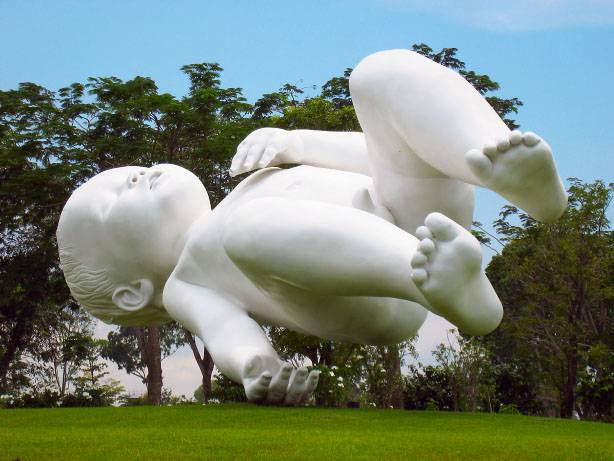 It's a big baby by a big-name artist set in Singapore's hottest tourist destination: the manicured Gardens by the Bay. Inspired by the artist's son, Marc Quinn's "Planet" is a 30-foot, 7-ton behemoth on permanent display, but appears to be light as air, floating like a balloon off the ground. Critically, opinion has been pretty mixed, but as far as the visitors are concerned, it's still a fantastic photo opportunity amidst the horticultural genius of the 250-acre garden, reminding one about the fragility and wonder of life (helps that the Marina Bay Sands is in the background, too). The sculpture is also a favorite of bridal photography companies, probably to give Asian couples on an "auspicious" start to their family-making efforts. 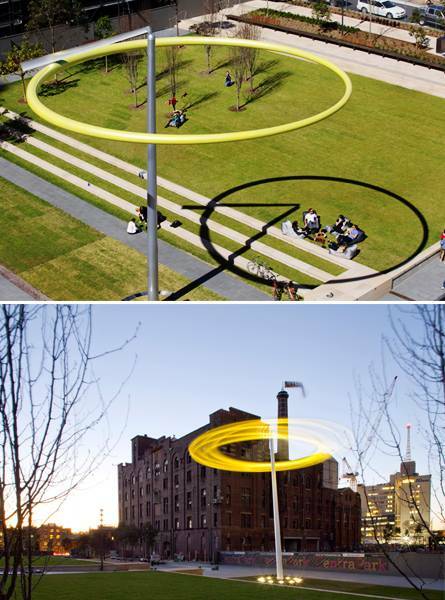 Celebrated Australian public artists Jennifer Turpin and Michaelie Crawford created the monumental wind-activated kinetic sculpture "Halo" as a centerpiece to the redevelopment of Chippendale Green, an old brewery site in Central Sydney. The piece's movements belie its imposing form -- a 36-foot wide giant pearlescent yellow ring cast from carbon fiber attached to a 18-foot-long silver arm pivoting off center atop an angled 39-foot-tall silver pole -- its movements, ranging from slow tilts and turns to more dramatic pitches and rolls, are a poetic dance to the tune of the ever-changing speed and direction of the wind. Pure and elegant in appearance, the deceptively complex $1.3 million sculpture is an epic feat of engineering that required three years of research, design, and testing as well as the knowledge and knowhow of a number of specialists from a range of disciplines. According to Crawford, "The beautiful circular supports for the enormous old brewing vats inspired the form of 'Halo' and a desire to reference the tipsy effects of beer resulted in the ring's precarious balance and off-centered tipping and turning." Cheers to that. Known for his existentially comic tone and a multimedia practice that bends to his whimsy, Swiss-born, New York-based artist Olaf Breuning unveils his first-ever public art installation October 29 in Toronto. 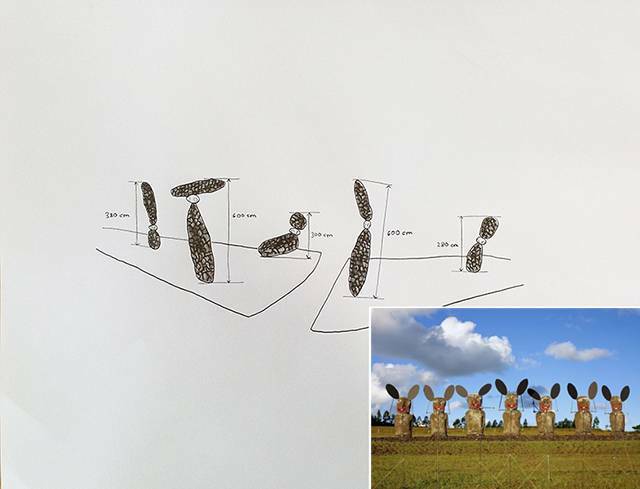 "The Guardians" takes its material from an earlier photographic work, "Easter Bunnies" (2004), which received chortling praise for the artist's young and spirited treatment of a long-haunted and much-allegorized site, the cluster of monolithic sculptures (moai) that stalk the shores of Easter Island, the world's most remote speck of inhabited land deep in to the Pacific Ocean. Here Breuning produces a cluster of sculptures that precariously inhabit Toronto's Liberty Village (65-75-85 East Liberty Street). Discussing the work's intended effect, Breuning hopes we'll wonder, "Oh, they could just fall down." Among the dreary loading docks in the industrial Chai Wan neighborhood of Hong Kong, the colorful Vaford Gates -- named after the prominent construction company whose warehouse entrances they cover -- pop incongruous against sooty factory buildings. Here, Above Second gallery's May Wong has taken a cue from New York's Bowery Mural and Miami's Wynwood Walls to turn otherwise bleak shutter roll doors into temporary exhibition spaces for contemporary artists. Right now, UK graffiti artist INSA's large splash of abstract patterns mix with hyper-real depictions of female body parts and fashion. 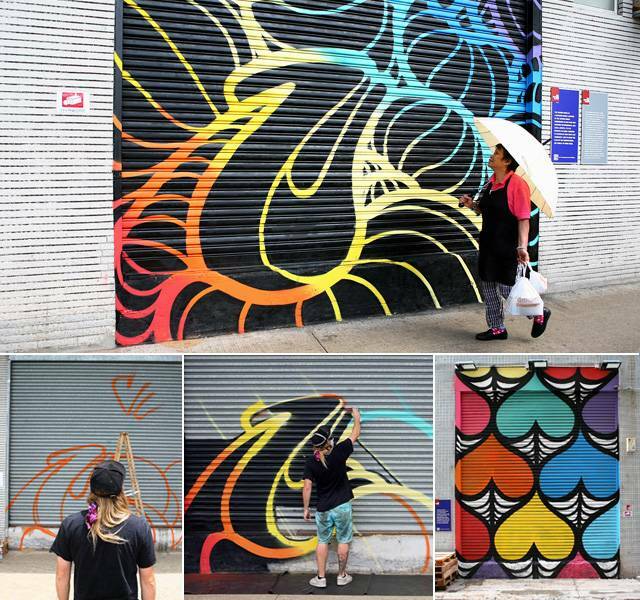 Come January, a new muralist will have a go. As Chai Wan's gentrification snowballs and more artists, galleries, and designers move into the area, the Vaford Gates (Gate 2 & 5, Paramount Building, 12 Ka Yip Street, Chai Wan) will become a visual marker of the creative energy of the neighborhood. Long decried as a waste of funds and a blemish on the city's art scene, an outdated 1980s South Korean law mandates that every new skyscraper has to commission a work of public art, giving rise to haphazard, second-thought sculptures. While the law is finally being addressed politically, the Seoul Foundation for Arts and Culture is taking a grassroots approach with their "City Guerilla Project," which had 60 artists create 150 works across five neighborhoods. 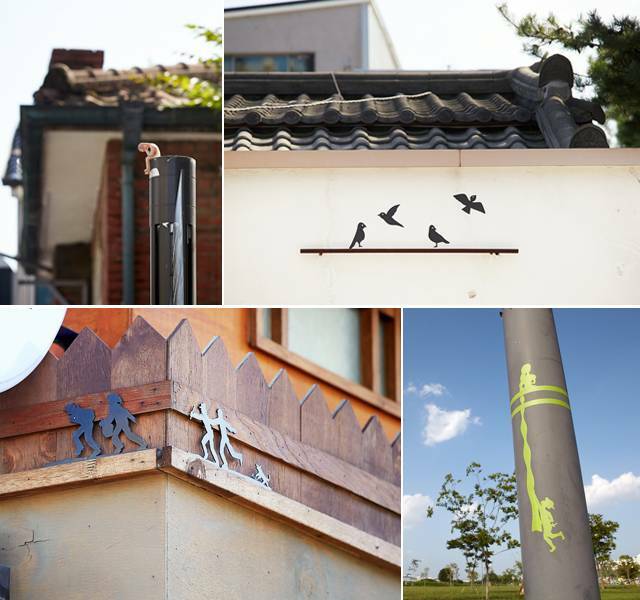 The most poignant have been in idyllic Bukchon, where Lee Gu-young (of Public Art M) directed a team to enliven the winding traditional alleyways with engaging, whimsical pieces hidden beside mailboxes and walls. Though more endearing than pioneering, the project has nevertheless gotten locals to stop and rethink the purpose of art. 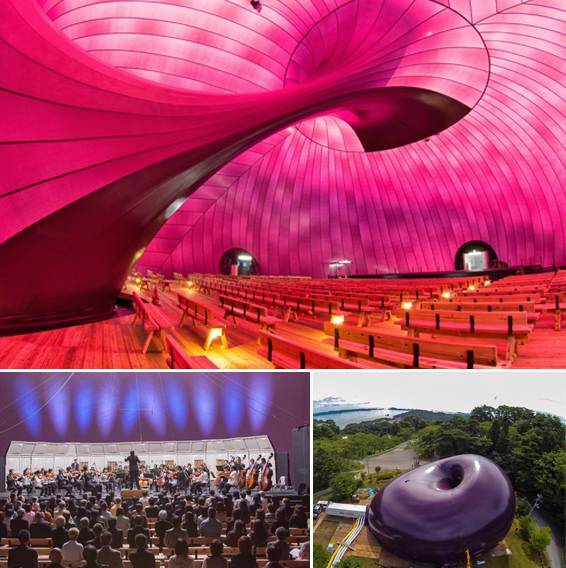 Working together with renowned Metabolist architect Arata Isozaki, Anish Kapoor has designed Ark Nova, the world's first inflatable concert hall, which will tour parts of Japan's Tohoku region that were devastated by the quake and tsunami of March 2011. The Ark will initially be stationed in Matsushima City, where it will host a Japanese version of the Swiss Lucerne Festival, featuring kabuki artists, a range of both traditional and contemporary concerts, performances by the Sendai Philharmonic Orchestra, and youth ensembles directed by Ryuichi Sakamoto and Yoshihide Otomo. The sinuous, organic curves that have become a Kapoor trademark have been deftly translated into a vivid purple balloon-like membrane that projects a softly luminous glow from the interior when sunlight from the outside is refracted through its translucent surface. The 500-capacity mobile artwork is particularly poignant in the context of post-Fukushima Japan, where recent projects by contemporary artists have struggled to engage the question of what art can do in the face of the sobering physical realities that have been brought about by the disaster. 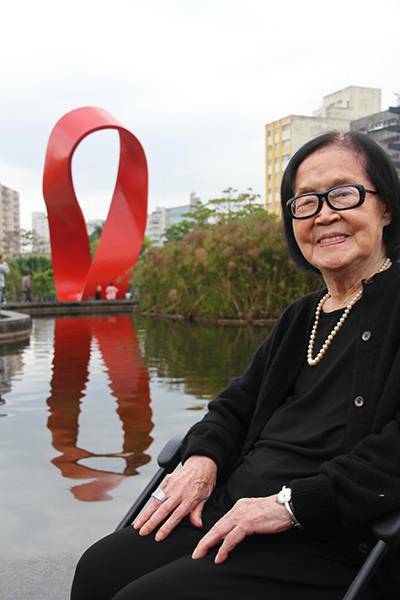 On the eve of her 100th birthday (November 21), the renowned Japan-born Brazil-based artist Tomie Ohtake just launched a new work in Santo André, a municipality 14 miles southeast of São Paulo's city center. Named "Monumento ao Trabalhador" (Monument to the Worker), the 36-foot high and 15-ton abstract sculpture looks likes a giant red ribbon and invokes the concept of infinity -- not to mention controversy. Since it has the color and the name that resemble a very popular political party in Brazil (PT - Partido dos Trabalhadores), there were requests to not accept the work in the city, but since it was created by Brazil's most reputable female artist, they were eventually overruled. As of September 29, the sculpture was moved to a prominent space outside Santo André's Paço Municipal (City Hall). When the French artist Bruno Peinado was asked to create a work for The Mabilais, a 1973 modernist building by visionary architect Louise Arretche and former HQ of a French telecommunications firm, the artist decided not to add on or invent a new form, but underline the original structure, specifically the antenna and control platform, and paint by light. "Tatitati tatata tatiti ti, un code dans la ville" (a code in the city), switched on October 3, has fast become a new emblem of Rennes, the capital of Brittany, looking at times like a spaceship and computer LED -- or perhaps a blinking James Turrell -- an arty lighthouse sending out Morse-coded messages in luminous flashes from dusk till dawn. The re-opening and expansion of LAX's Tom Bradley Terminal (designed by Fentress Architects) doesn't just mean more flights, it means more art. To celebrate the doubling of its exhibition space, Los Angeles World Airport's art program presents its first-ever public art festival Influx: Art at LAX, a temporary adjunct to the permanent installation of 28 original site-specific video works that were unveiled last year. Eleven original installations by local artists include Pae White, whose tapestry entitled "Woven Walk" hangs in the international arrivals corridor, and Mark Bradford, whose "Bell Tower" is suspended over a security screening area, both in the new terminal. 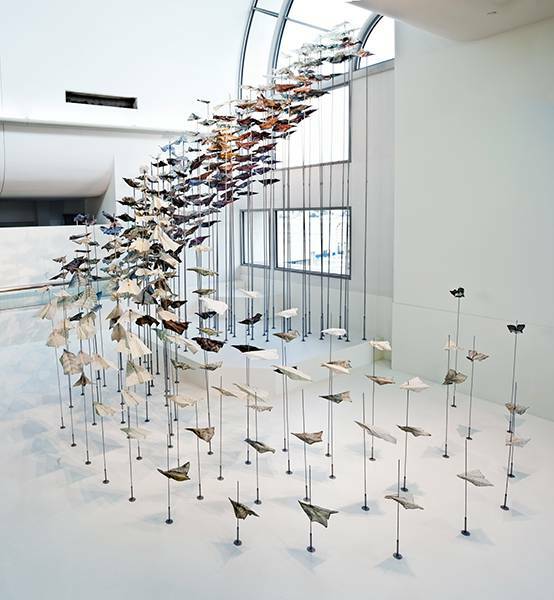 Joyce Dalal's playful sculpture, "Elevate" features hundreds of colorful paper airplanes rising in a graceful arc in the departures atrium of Terminal 3. "Influx: Art at LAX" can be found by boarding gates, coffee shops, and baggage claims throughout the terminal, but only until the end of the year. 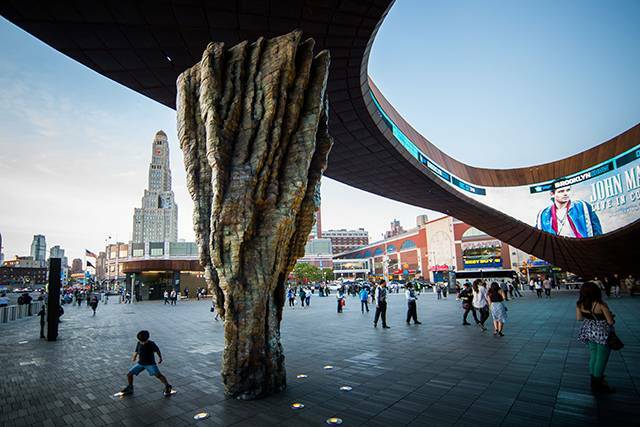 The contemporary art commissions at Brooklyn's Barclays Center keep on coming as the behemoth arena recently installed Brooklyn-based artist Ursula von Rydingsvard's 20-foot bronze sculpture "Ona" out in front. "Ona," which in Polish means "her," is constructed from 50 individually-cast bronze sections. The installation of the sculpture comes just before the screening of a new Brooklyn-themed video work by artist collective OpenEndedGroup to mark Barclays's one year anniversary. The new video, "All Day," which is set to debut on the entrance's outdoor video screen October 10, is the group's second Barclays outing, as their video "After Ghostcatching" inaugurated the new building in 2012 along with a Mickalene Thomas mural and a 70-foot-long painting by Miami-born, Brooklyn-based artist José Parlá. Barclays board-member David Berliner, who is responsible for the contemporary art programming, appears to be positioning the arena as not only a sports, shopping, and entertainment complex, but also a place to see trendy public art.